The ‘Breaking the Myths’ exhibition and dissemination event hosted by Diversity House at the Royal Overseas House on 24th October in London turned out to be a fitting occasion to close the two year project. Created to promote awareness of the contribution of Africans in World War One, the exhibition displayed the vast amounts of information, artworks, artefacts and stories that had been unearthed by the project. Using community groups, schools, academia and everyday people across Kent, London and beyond, Diversity House proved that the first world War could no longer be viewed as a ‘White man’s War’ in which Africa had been relegated to the margins. The reams of research and hitherto unknown stories highlighted Africa’s central involvement and raised the level of her contribution financially, materially and in human input, resulting in heavy loss of lives of men, women and children drawn into the conflict. Kat Francois put her talents to excellent use and captured the events and sentiments of a people whose sacrifices had been ignored by the very powers which had forced their involvement into a conflict about which they had no say or control. 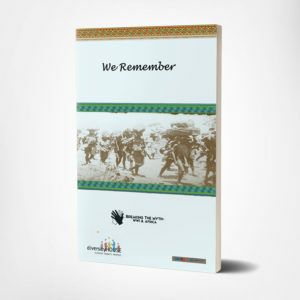 Much of the research and stories emerging from the project have been recorded in a book ‘We Remember’, on sale at Diversity House. The culmination of the two year project is celebrated in the erection of a memorial dedicated to all commonwealth service men, women and support workers who sacrificed their lives for our freedom. The inauguration ceremony was hosted by Swale Council in partnership with Diversity House on 28th October coinciding with remembrance celebrations worldwide. From Motherhood to International Acclaim, Mercy Francis PR Connects People and Businesses. The views expressed in Diversity Business Magazine do not necessarily reflect those of the Editor and Publisher.